It’s like a phone booth where the phone is replaced by two microphones and a touchscreen. It’s a karaoke private room customized for a couple or two best friends. A mini karaoke booth popped up in the New World shopping mall at Flushing in August, offering a cozy and well-equipped singing space. The karaoke booth is 7 feet tall and takes up approximately 24 square feet. When in use, the light effect and air conditioner will be turned on. Compared to a traditional karaoke room that is normally 5 times bigger in size, the karaoke booth satisfies some customers demand for more privacy. Another part of the attraction is the affordable session prices compared to a night at a karaoke bar. Customers can choose to sing a song for $2 or half an hour for $8 and an hour for $15, while a karaoke bar normally charges $35 at minimum an hour in New York City. 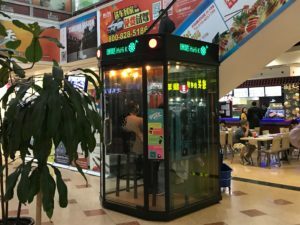 With their compact size and inexpensive price tags, karaoke booths have become a real game changer of the karaoke industry in China. It is an affordable choice for entrepreneurs to give a shot at, too. On Taobao, the Chinese version of Amazon, karaoke booths are sold for about 25,000 yuan or $ 3,640 US dollars. As more booths pop up in the malls in cities like Shanghai and Beijing since their debut in 2016, the market scale of mini karaoke in China has reached over 3.5 billion yuan or $510 million by the end of last year, and will grow over 14 billion yuan or $2 billion by 2019, according to a Chinese media white paper of 2017. Meanwhile, the scale of traditional karaoke bars has declined by 13.3% since 2010, according to another Chinese karaoke market report. But it seems that so far this thriving trend overseas has not worried local karaoke owners in Flushing, Queens.